Is this the 2015 Ford Mustang? Close to it, at least that’s what a Ford insider told us recently. 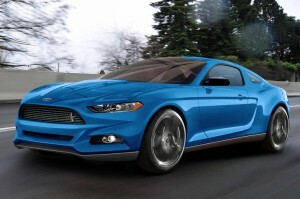 Set to be released about two years from now on its 50th anniversary, the 2015 Mustang will be much closer to a “world car” than any Mustang before it. For one, it will be smaller in many ways. Most other markets prefer sports cars with a little less metal and a few more curves. 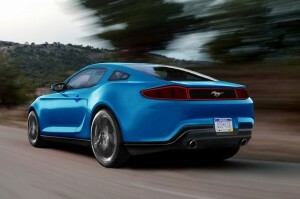 That means a sleeker, less bulky Mustang that should weigh less and cheat the wind better. The Evos concept was a hint of that look, but we were assured that the current Mustang’s long hood/short deck proportions will remain along with several signature Mustang design cues like rear-quarter windows and triple-lens taillamps. A little bit of Ferrari on the side panels, a little bit of Aston Martin in the front, yes, we like it! 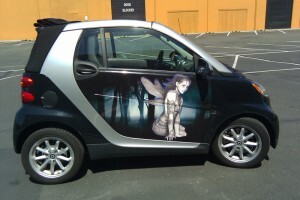 This, along with other great American sports cars, is a great target for personalization through vehicle wrap. 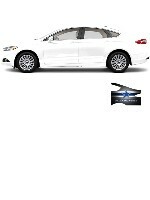 Non permanent, you can have that carbon fiber roof or those racing stripes for a fraction of the cost of a paint job. Expect to see the official unveil of the 50th Anniversary Ford Mustang at the 2014 New York Auto Show. Custom Wrap for the Car Enthusiast! A custom car wrap just for fun? Well, yes, that is possible but there are definitely some other advantages to consider as well. First of all, it’s a hell of a lot cheaper than a custom paint job. 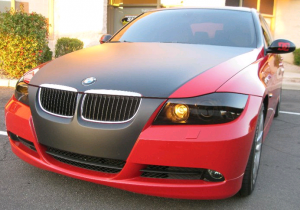 The cost of a full wrap of the entire vehicle including bumpers is between $3,000 and $5,000, depending on the complexity and size of the vehicle and much less for a partial wrap if you don’t need to change the car’s color. Now, you can probably re-paint your car for that amount of money; but can you get a design or some special effects; most likely not. At Sema a few years ago, the guys from Wrap Experts, Dallas TX, applied a custom wrap each day on a Ford Mustang GT during the introduction of Wraptivo® by Meguiar’s®,this picture is a sample of their work. It was a great exercise in how you can change the look of your car completely through a custom wrap. So, what are the other advantages? 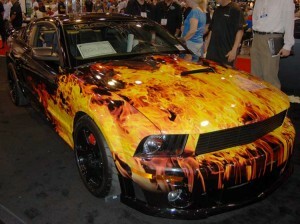 There are more advantages for a wrap versus a custom paint job. First of all, a vinyl wrap will actually protect your factory paint job and if you get tired of it, you just remove it and your paint will still look like new. You can choose for a high gloss laminate for your wrap and it will look as shiny as a fresh paint job. Other advantages are that you can change the color of your car, get those racing stripes or flames you always wanted and of course draw a lot of attention; whether it is during enthusiast gatherings, car shows or simply at the parking lot of your local mall.